I've spent the better part of the past week waylaid by headaches and nausea that I got after attempting to go back to CrossFit after almost 2 months off. (The headaches and nausea still haven't gone away, btw. I hope it's not serious.) 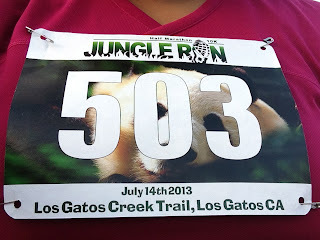 This definitely complicated things for me on Sunday when I went to the Jungle Run. By all accounts, I probably shouldn't have even gone, but I'm stubborn, and plus, with two full marathons to train for, it's gotten really hard for me to find other races that fit my schedule. So off I went with my friend Sonia in search of half marathon #11 on the year. Saturday was Brazen's annual endurance run, the Dirty Dozen. 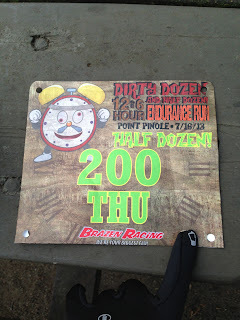 I did this one last year as my first Brazen race ever, and since then, my love for this company has only grown. I have been pretty non-active lately since the end of the school year, so I didn't have particularly lofty goals - my training schedule (oh yeah! I've got a marathon coming up!) specified 16 miles, so that was my plan, and 6 hours is well more than enough time for me to cover that, even walking. The loop went a lot faster than I remembered, and definitely not because I was moving faster :) (Because I wasn't.) The hills also weren't as bad as I remembered them being, but considering how I've done three SUPER hilly half marathons with Brazen in the past year, that's not surprising. They really weren't so bad. 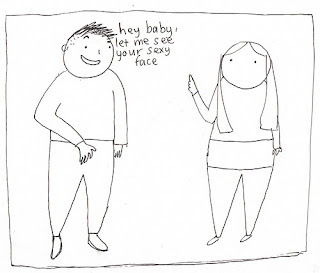 When is a compliment not a compliment? As part of my marathon training program, I have long runs I'm supposed to do on the weekends. The main part of the trail that I'm usually on is 6 miles long, and since most of the time (whether I'm training or not) I don't usually have to run more than 12 miles, I rarely have to venture past the 6-mile marker. But this weekend I did - I had a 14-miler on Sunday (and it will only go up from here). This other part of the trail covers an additional two miles and has a different feel from the first 6 miles (to me, anyway) - it runs not through a pretty park but under the freeway overpasses, and while it does get its fair share of athlete traffic (runners and cyclists), it's also kind of scary to me. Maybe because I'm rarely there and am less familiar? And maybe also because it's fairly common to encounter... um... unsavory types on that part of the trail.